How can the world feed 9 billion people? Aurélie Harou is a post-doctoral research fellow at Columbia University’s Earth Institute Agriculture and Food Security Center and the International Research Institute for Climate and Society. Modesta Nnedinso Abugu is a fellow at the Cornell Alliance for Science Global Leadership Program. Both were members of the Junior Researcher Task Force at the 2nd International Conference on Global Food Security following theme 6. Last week, leaders and experts travelled from 67 countries to Ithaca, New York in order to discuss several burning questions potentially threatening our global food security, including ‘how can we feed a world carrying 9+ billion people?’ While no simple or straightforward solution emanated from the discussion at the 2nd International Conference on Global Food Security, what was clear was the critical role three types of technologies will play in ensuring our future ability to feed the planet with nutritious food. The ever-contentious genetic engineering (GE) has the potential to increase global food security. Experts, including Keerti Rathore of Texas A&M University and Clet Wandui Masiga from the Association for Strengthening Agricultural Research in Uganda, heatedly discussed different approaches of using GE technology to increase food production and impediments to adoption of the best alternatives. Scientists also discussed how they were using GE. Rathore explained how his lab uses gene-silencing technology to reduce the gossypol content making cottonseed a potential protein source for feed for poultry, cows and fish. Masiga explained how we could use phenotyping to create striga-resistant genes. Kennedy Dzama from the University of Stellebosch in South Africa discussed how we might use GE to create parasite-resistant livestock. While most attendees seemed to agree that GM crops are one important vehicle to help feed the hungry, consumer acceptance of the technology around the world has been slow to follow. For example, while Golden Rice—the first GE crop specifically tailored to improve human nutrition—has the potential to prevent 500,000 annual cases of blindness through the heightened levels of beta carotene, a source of vitamin A, it supplies to consumers, its acceptance and cultivation remain limited due to consumer and advocacy groups’ pushback. Attendees had a chance to critically discuss many of the common concerns about GE crop technology during a workshop café session chaired by Daniel Otunge of the Cornell Alliance for Science: does GE drive the homogenization of the food supply? Does GE financially benefit or burden farmers? Why has GE not yet addressed micronutrient deficiency? Is GE a vehicle for multinationals to make money on the backs of the poor? Session attendees generally agreed that GE might encourage the use of fewer varieties, but that it would benefit farmers (in addition to multinationals) and that once it becomes more accepted by the public, the technology costs will decrease enabling GE to tackle other concerns like micronutrient deficiencies, as was also highlighted by Jennifer Thomson of the University of Cape Town, one of the keynote speakers. 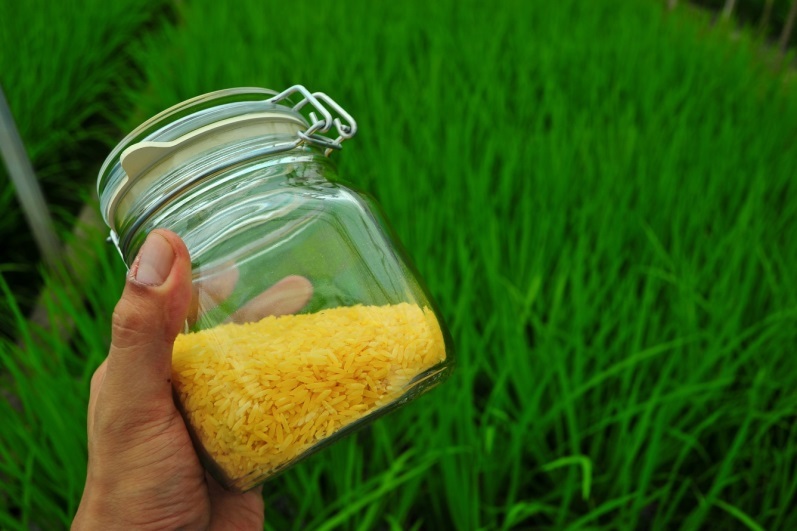 A jar of Golden Rice, genetically modified with added beta carotene—a source of vitamin A. Photo source: International Rice Research Institute. The second set of technologies that will undoubtedly play a role in enhancing our global food security is the use of computational advances like cloud computing and machine learning in our research and decision support. Such technologies have the potential to more accurately monitor food needs and aid in our ability to enhance production. For example, Stephanie Debats from Princeton University described how she used an algorithm to study agricultural fields in South Africa. Her techniques could be used at a larger scale to map agricultural fields more accurately than is currently being done using remotely sensed images. Shai Sela from Cornell University described a software “app” he and a team of researchers helped to create called Adapt-N, which helps farmers choose the optimal rate of nitrogen application for maize based on a model that accounts for locally-specific precipitation, temperature, soil type, organic matter content, tillage, previous crops, planting date, etc. Simic Milas from Bowling Green State University discussed how she uses spectral separation in remote sensing images to differentiate organic from conventionally treated crops in North America. Researchers and practitioners presented a wide range of other interesting technologies for use in actual food production and processing. Torborn Tronsden described Coolnova, a patented cooling method which has the ability to protect food during chilling, freezing and defrosting, potentially significantly reducing post harvest losses. David Denkenberger presented alternative sources of food, including insects, funghi and bacteria (! ), which we may be forced to eat in case of a 10 % reduction in global food production, due, for example, to abrupt climate change, volcanic eruption, war, extreme weather, a comet, weeds, crop pests, bacteria, etc. The emergence of new technologies offers hope to those of us who might worry about the future of our global food security, particularly given agricultural intensification challenges discussed in other conference sessions. While the conference offered hope that useful technologies do exist, the next step is cleverly implementing a process by which farmers and practitioners learn to effectively use and adopt these technologies to their specific challenges. This entry was posted in Uncategorized and tagged agriculture & rural development, conference, food security, GFS2015, summaries, technology, technology adoption. Bookmark the permalink. 1 Response to How can the world feed 9 billion people? There is however no one who has really had a clear-cut answer on this topic, how do we feed 9billion people? those criticizing GE products have never asked this question, they don’t forecast, they are not concerned, it is however our duty as scientist to solve problems of this nature in the society thus we r concerned. my position here is this, we know we are championing a good course devoid of our own interest nor that of the multinationals, but for the interest of the society, we also know everything we do are guarded by empirical proofs, lets keep the faith, I’m optimistic that soon this technology will be soughted for by every one when they come to knowledge of its potentials, it’s products will thrive in a short while, for this to be possible we need to reinforce adequate publicity, not just publicity but the public needs orientation and education on our products and programmes using every possible means, because the public have a very wrong perception about biotechnology. All G.E needs now is publicity in such a way to convince the public, policy makers e.t.c. The scientific community should therefore give keen consideration to genetics literacy project. knowing fully the potentials of G.E, with it we will feed the world.. #with G.E no barriers. "Most of the people in the world are poor, so if we knew the economics of being poor, we would know much of the economics that really matters. Most of the world's poor people earn their living from agriculture, so if we knew the economics of agriculture, we would know much of the economics of being poor."